As 2017 comes to a close, we've been reflecting on how many couples we've been lucky enough to work with who we would consider our "ideal" clients. 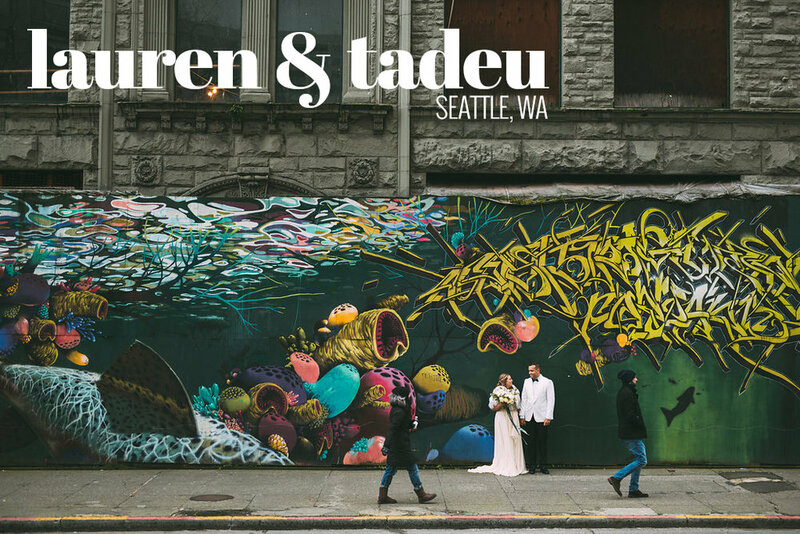 Lauren & Tadeu are one of those couples. I (Carly) met Lauren & Tadeu in 2015 when I was visiting my brother- and sister-in-law in Seattle. I had a spare afternoon so I put out feelers to see if anyone who followed me on instagram would be interested in a free couple's session. Almost immediately I received an email from Tadeu that said he was about to propose to his partner, and he thought it would be fun to surprise her with a photo shoot as well. I was super stoked on the idea of the shoot being a surprise treat, and I asked him to share more about them. He replied: "I'm a second year law student. I'm active in racial justice and prison abolition work. I am Latino (Brazilian) and that is really important to me. Lauren is a fourth grade teacher. We actually met the first day of college because we were both in the same orientation group (I was originally going to be a teacher too, but found that I'm not nearly as patient as I need to be). We are both very family-oriented. We have a cat. We like art. We run." I'm sure you're not shocked to learn that I was immediately struck by knowing that we NEED to be friends and we set the shoot up. Prison abolitionist lawyer and rad molder of young minds? YES PLEASE. When I met them in person, their energy was extremely positive and they had a super strong vibe of support and mutual respect. We had a lot of fun tromping through the rose gardens, fountains, and beautiful plazas of UW, and overall it was a beautifully low-key afternoon. I sent them their photos a few weeks later and crossed my fingers that they would hire me for their wedding. Tadeu's mom giving a toast in Portuguese (with the help of a friend who translated), expressing so much pride in her son and reflecting on the journey she has taken as an immigrant and in raising him solo. Not a dry eye in the place. The first look we did just outside the Seattle Public Library - the architecture there is so fabulously geometric. Stroke of midnight confetti explosion - made for excellent photos as well as lots of fun re-dos as people were goofily picking it back up off the floor and tossing it around.